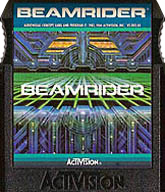 ColecoVision.dk presents: Beamrider © 1984 by: David Rolfe, Activision Inc. Initially © and Licenses: Activision Inc. 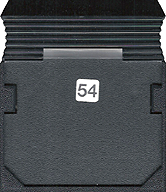 Original SFX Programmer: Activision Inc.
ColecoVision SFX Programmed by: Activision Inc.
ColecoVision PCB Size, Type and Producent: 16kb., Activision Inc., Activision Inc.
ColecoVision Cartridge #, Casing and Producent: VS 003-04, Standard Black Activision Style, Activision Inc.
ColecoVision Label Art and Design by: Activision Inc.
ColecoVision Manual Layout and Design by: Activision Inc.
ColecoVision Manual # and Manufacturer: VS-003-03, Activision Inc. U.S.A.
ColecoVision Box Art and Design by: Unknown, Activision Inc.
You can play this game with up to 4 other players. Adventure into unknown worlds !. An unpenetrable shield surrounds the planet. Your mission is to ride criss-crossed beams of light all the way to the 99th sector. Cast lariats of laser bolts into red zig bombs, yellow chirpers, the evil mothership, and more !. Only you have the courage. Only you have the skill. Only you are the Beamrider !. High Score For The ColecoVision Version Of: Beamrider, Level 1. XName: Troy Whelan. XName: Mangia-Boy. Name: Ole Nielsen. 1st XScore: 53.950 - Juli 04, 2003. 1st XScore: 71.520 - February 04, 2012. 1st XScore: 3.000 - February 16, 2008. Name: James Carter. Name: skosh. Name: Ole Nielsen. 2nd XScore: 52.596 - June 11, 2004. 2nd XScore: 69.230 - February 10, 2012. 2nd XScore: 1.952 - August 28, 2008. Name: Greg Troutman. Name: jblenkle. Name: Ole Nielsen. 3rd XScore: 29.398 - June 11, 2004. 3rd XScore: 68.420 - February 08, 2012. 3rd XScore: 1.352 - March 01, 2015. Name: Curtis Hepworth. Name: jblenkle. Name: Ole Nielsen. 4th XScore: 8.696 - August 20, 2001. 4th XScore: 65.114 - April 30, 2018. 4th XScore: 852 - March 01, 2015. High Score For The ColecoVision Version Of: Beamrider, Level 2. High Score For The ColecoVision Version Of: Beamrider, Level 3. 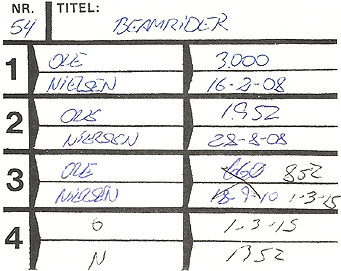 ColecoVision.dk Game # 54, Beamrider is last updated: March 24, 2019.